For the second time this year, the team on the top step of the podium in the German Endurance Championship did not cross the finish line in first place. “This was surely our most expensive overall victory ever,” was how Wolfgang Land summed up the 37th Adenauer Rundstrecken-Trophy on Saturday (May 20). 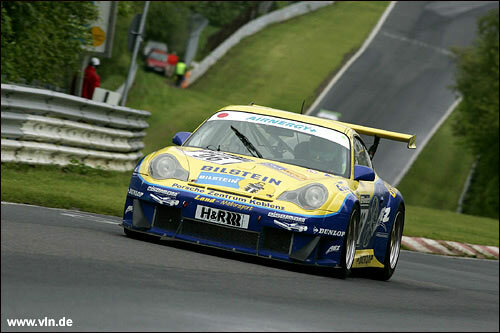 His team’s Porsche 996 GT3 RSR ended its day against a guardrail on the Döttinger Höhe straight, right around the same time the race was red-flagged. From pole position, the driver team of Macr Basseng and Patrick Simon had had a firm grip on the race - until more heavy rain set in with some 90 minutes of racing still to go. 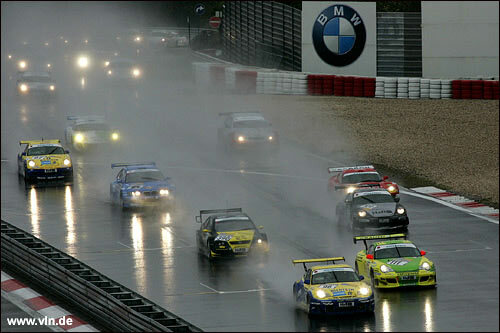 The rain caught out Simon on the Döttinger Höhe; and the torrential downpour, and the resulting incidents and accidents all around the track, caused the officials to call it a race, and declare the standings as of lap 13 – the last lap Simon (below) had completed. Trailing the Land Motorsport car by some two and a half minutes was the #111 Manthey Porsche of Marcel Tiemann (“we were on the wrong tyres all the time today”) and Arno Klasen, with Andreas and Ralf Schall and Volker Strycek in the ex-works Opel Astra DTM coupe third. 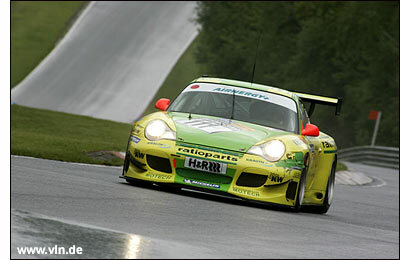 The Sabine Schmitz / Klaus Abbelen 997 is no longer in the care of Land Motorsport; in their first race “under new management”, the local pair missed the podium by some three minutes and 52 seconds, while fending off the hard-charging Red Bull BMW M3. Starting from pit lane, Dieter Quester and Hans Stuck had all 59 other starters in Group 1 in front of them, and had worked their way past 55 of them when the red flag stopped their progress. Stuck also kept an eye on the exploits of his son Johannes, who shared a BMW 120d; this team ended up in 50th place. A sister car won the alternative fuels classes with ease, the championship-leading team Claudia Hürtgen / Marc Hennerici once again producing a fine drive for Schubert Motors and crossing the line in a fine 7th place overall, and still on the lead lap. One would have assumed the conditions would have favoured the all-wheel driven machinery, but while some of the 4WD teams did make inroads, they were ultimately never a factor in the race for victory. From 32nd starting position, Elmar Deegener and Jürgen Wohlfart hoisted their Raeder Motorsport Mitsubishi Lancer Evo 8 up to 9th overall; the Autosportif Subaru Impreza, which had lined up right alongside them on the sixteenth row of the grid, did not fare so well: Phil Bennett / Jonathan Price / Alan van der Merwe had to be content with 65th place. Raeder’s other car, the brand new Lamborghini Gallardo, turned a few heads in qualifying with its fetching new livery, but failed to make the race in its maiden outing. Lambo-Racing’s tried and tested Gallardo started from 15th place, then dropped out of the “top 90” on the first lap. Stephan Rösler /Georg Silbermayr managed to claw their way back up to 12th place, behind another all new machine, the Audi RS4 built by factory-affiliated team Götz Motorsport. While most drivers walked away from the several incidents brought about by the bad weather, Britain’s Ian Mitchell (who raced at Le Mans last year) had to be airlifted to a nearby hospital following a collision with another car; he suffered injuries to both legs. With the non-championship 24 Hours now taking centre stage, the German Championship rests until July 8.